Best Books for Boys: Robots! 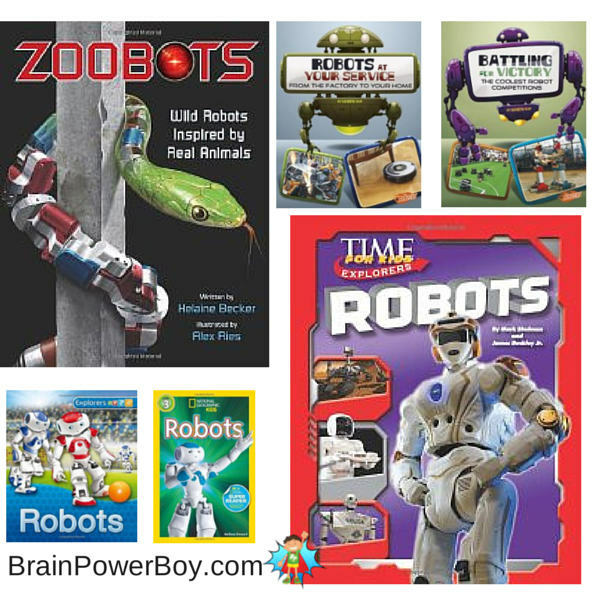 If your boy is interested in robots, have I found some great books for him! 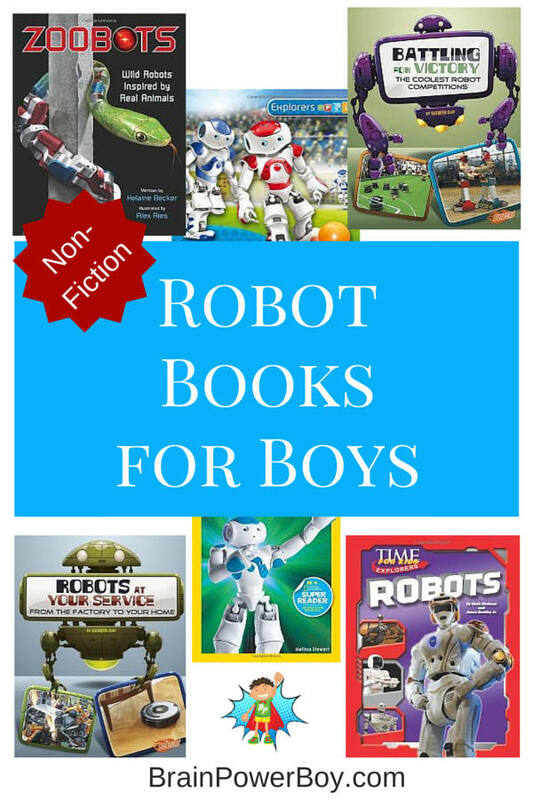 I dug through a lot of robot books to find the best books for boys on this fun topic. These have a lot of appeal, are engaging, and have great images. Robots are used in so many areas of our lives. I really had no idea that they have come so far. All of these books give great examples of robotics, how it is being used, what direction things are going, and the very neat things people are inventing in that field today. Some of these books are sure to get boys reading. I couldn’t put my highly recommended selection down and my son thought it was equally good too. Robots are a perennial boy favorite and I am certain that your boy will find books that he will enjoy in this collection of non-fiction robot books. Robots at Your Service : From Factory to Your Home by Kathryn Clay. This book is great for younger boys who are interested in learning more about robots. Nice pictures with basic text that is not overwhelming. If they use a word kids might not be familiar with they define it on the page. There are also “robot fact” blurbs throughout the book. Battling for Victory : The Coolest Robot Competitions by Kathryn Clay. I looked specifically for a book on the robot battles because these can be really fascinating for boys. I had heard of LEGO League and some other robotic meets but there are a lot more out there that I never knew existed. The text is geared toward younger kids but definitely worth a look for anyone who is interested in learning about these fun events. National Geographic Readers: Robots is just what it says–a reader. The text is geared toward kids 6 – 9. There are good explanations of the basics in robotics, starting with the obvious “What is a Robot?” The glossary is pretty neat as it includes images which is a bit unusual. For younger boys. Explorers: Robots by Chris Oxlade gives us a glimpse into what robots are and how they are used in different areas of our lives. There are a lot of nice pictures and the text is approachable. The images are marked with numbers that tell what is shown and there is a little “what is that?” picture in each section which is a fun addition. Robots by Mark Shulman and James Buckley Jr. This is one detailed robot book! Starting with robot history and moving on through protections, exploration, flying and more there are a lot of examples of robots and plenty of great pictures as well. I love the Kids Make section which includes LEGO Mindstorms and other robots kids can make and use. This books just might get boys inspired to make their own robot! Zoobots: Wild Robots Inspired by Real Animals by Helaine Becker. Super interesting and really well done; this is an intriguing book. Roboticists are using animal characteristics to build robots that do things humans cannot do. Uncle Sam is a snake like robot used for search and rescue. Octobot can squeeze into narrow crevices. Stickybot III is based on a gecko and can climb smooth surfaces. I could go on (and on) because these robots are just so neat and fascinating. Highly Recommended! If your boy loves robots or is even remotely interested in them, give these books a try. They are really fun to look at and he is sure to learn a lot. Don’t forget to try Zoobots, our highly recommended selection. It is really good! We will be putting out more posts on robots and robot books in the future. Other fun books for boys. What does your boy like about robots? Does he have a favorite robot book? Leave a comment. Great robot book choices! I love the books for kids from National Geographic. I’m going to look for that one the next time we are at the library. I don’t think I realized how many robots books were out there, lol! It’s a great way to sneak in a little science too!